My Name is Amber Rose Riley and I am 24 years old. At the age of 16 I was arrested and tried as an adult for something an adult male admitted to doing. I awaited trial for seven years and was still convicted even after he plead guilty. I was given 26 to Life; I have only been in prison for about eight months but have now been incarcerated almost eight years. I am currently appealing my case do to the fact that numerous things were done wrong. Evidence on my behalf was not used, my trial lawyer did not put up a defense for me, knowing I had been physically and sexually assaulted by the codefendant prior to us both being charged for the murder of our mutual friend. I was totally distraught during my interrogation and since I was too afraid to tell on him, I lied and it cost me my life. I have never been in trouble before and I have always lived at home with my parents. Due to being low income, we depended on the courts and on the Public Defenders office to and no matter how hard we looked, how much evidence we had in my behalf, no one wanted to get involved due to the specific District Attorneys that were involved. I also put in for a mistrial and fought for a year to get one, but the same Judge that did my trial denied my motions even though there were so many things done wrong with my whole case. From the interrogation through seven years of court hearings and my trial, public defenders didn’t want to look into my ‘touchy issues’. CLAREMONT, Calif. – When a number of formerly incarcerated women last year received what they thought was a distress e-mail from a friend, Gloria Killian, saying she was stranded in Scotland penniless and needed to have money wired to her ASAP so she could fly back to California, at least two of them rushed to their banks to see how much they could pull out. Another decided she would send Killian everything she’d been saving up – more than a years worth of savings — to put herself through school. She quickly went online and alerted her contacts about the email hack. 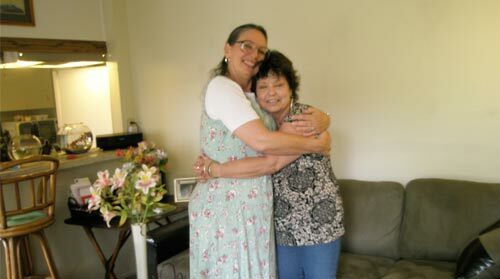 “The fact that so many friends were ready to jump in to help, shows we are there for each other,” said Killian, 65, who had spent the better part of two decades inside a California prison, for a crime she didn’t commit. Exonerated in 2002, Killian is now the executive director of the Action Committee for Women in Prison. She is also the co-host and co-founder of the weekly webcast, “Women Behind the Walls,” the only show in the United States that is by, for and about incarcerated women. Many of the women who rushed to Killian’s aid were there for each other even while incarcerated in the California Institution for Women (CIW) in Corona. They formed bonds behind bars that only grew stronger after they were released, observed Killian. It wasn’t long before 16-year-old LaKeisha Burton – at the time of her trial, she was the youngest female ever to be tried as an adult in California — became a part of one of those families, after she landed in the Corona prison in 1989 on an attempted murder conviction. The wide-eyed girl with a megawatt smile immediately became “little sister” to some of the inmates, and “daughter” to some others. “The sisterhood between them is so strong that when a woman gets out, those left behind – even lifers who know they never will — wish her well,” Davison remarked. Burton, who is now 33 and has been out of prison for six years, said she still has formerly-incarcerated friends watching her back. Clad in a pretty, ankle-length floral frock, she dropped in at Killian’s Claremont home one recent day to say hello. She considers Killian among her cheerleaders, encouraging her to bigger and better things. Bonding the way women prisoners do is not as common among their male counterparts, some prison officials say. The way men socialize, on the other hand, is through an activity or engagement, Aberra said. And there’s not necessarily the kind of emotional connection between them that women have, she continued, nor do they depend on each other for emotional support. Wayne Davison, the husband of Dawn and also a retired prison warden, said he frequently observed this. Women inmates seen huddling together in prison yards, he said, were more likely to be nurturing each other and offering words of encouragement than “plotting,” which is what he observed often with the men. In prison, bonding between men can often manifest as gang activity. “With the men, there’s a pecking order in which race is often involved,” noted Wayne Davison. Friendships between male prisoners, he said, are made mostly to protect themselves; once released, they often go their separate ways. A week before Christmas last year, Killian again hosted what has become a popular annual “Convicts Christmas Potluck Party” at her home in Claremont. “It’s probably my sick sense of humor that made me give it that name,” Killian said with a laugh, when asked how she came up with the title. By prior arrangement, it was agreed that everyone attending the party would leave with just one present. Partners and other family members were welcome, but alcohol was taboo. “You don’t need to drink to have fun,” Killian said. About 60 people, most of them women, showed up. Three women who’d been out of prison for less than 72 hours were among the guests. There was a lot of catching up to do; stories to be shared. And even though there “was a lot of tears,” noted Killian, “everyone seemed happy to be back together again.” And, as it always happens, new friendships were struck and new networks formed. Keeble, whose 82-year-old aunt recently broke her dentures and couldn’t afford to get a new set, tapped into one of those networks. She sent them to Dee Cliburn, a fellow ex-inmate who knows how to mend broken dentures. Today’s mentoring story is brought to you by Madge Woods, the board president for the Action Committee for Women in Prison. That committee advocates for the humane and compassionate treatment of all incarcerated women, collaborates with other organizations dedicated to reforming the criminal justice system, works for the release of individual women prisoners who pose no danger to society, informs and educates the public and promotes a shift of focus from punishment to rehabilitation and restorative justice. We KNOW that mentoring after prison transforms lives, as demonstrated by the mentoring story of Attorney Rick Dyer. Through this mentoring story, Madge has proven that a thoughtful, caring mentor WILL improve the lives of others AND reduce recidivism, which is a person repeating an undesirable behavior after they have either experienced negative consequences of that behavior. Mentoring after prison isn’t something that we normally think about, but give it a thought today! I met her on parole, and now she’s AMAZING. Keisha is my mentee, technically really not anymore as she finished parole April 29, 2011, 5 years from almost the day I met her. Keisha has become so much more than what she was the day I met her. She had trouble making choices about everything (no choices in prison). She was more like the teenager she was when imprisoned at age 15 1/2 than the 32 year old woman standing in front of me. Having been one of the first juveniles tried as an adult in California she was sentenced to life plus 9. I never did understand this sentencing. When I first met Keisha, after she was out a month, we went to lunch with a program that we both signed up for, Volunteers in Parole (which is now de-funded). She was nervous and didn’t know how this would all work. But by the end of the lunch we were matched and the bond started. For 5 years we hung out. We went to museums, plays, shopping, lunches, dinners. Mostly we spent time just talking, in person and on the phone. We are very different. Our lives couldn’t have been farther from each other but somehow we waded through. I talked and asked questions and sometimes she answered me and sometimes she had no trust that she could tell me what she needed to say. But with time and work and energy we started to be friends rather than mentor/mentee. I guess this is proof of the Mentorology cycle at work! Keisha’s life after prison started back where SHE started. Living with her disabled Mom immediately put Keisha back in the position of daughter, only now she was taking care of her mother. We talked about her roles in life, her roles in her family and her dreams for her future, which needed a job to get going. Keisha got a job right away and it took a while to find the right fit. A few jobs later she settled in and at the same time started thinking about helping those lifers still in prison and those outside. She joined groups and started speaking out on her story. She spoke on stage and with friends and among total strangers. She started to become the adult she searched for. After mastering driving and cooking and making a place for herself within her Mom’s home, Keisha flourished. She dreamed of the day she was off parole so she could move to her own place and start the life she so deserved and worked so hard to attain. Now, 5 years later, she is reaching all her goals. If she had buried a list when going to prison, I think she would feel she is moving farther away from that 15 year old and more to who she believes she can be and checking off items on that list. From that first day, I cared about Keisha. I tried to introduce concepts that she had never learned or seen in her family-saving, checking accounts, credit cards, and insurance. She thrived and started saving for emergencies and for her future. Did she always make the best choices? No, but she made choices and accepted consequences and grew from each encounter. She had her tattoos removed from Homeboys and became active in prison reform. She started talking and couldn’t stop. She turned her life around. She took advantage of every possible program in prison, she graduated high school, she represented the women in prison less educated than she and helped with rules, regulations and programs in prison. She even went to Toastmasters and became a great speaker. We worked on some language and pronunciation and she continued to write and publish and perform. She became a tax payer, she now can vote and most importantly she broke the family cycle that had led her to crime to begin with. I have full faith Keisha will never offend again and will not ever put herself in a position where her character could be questioned. Keisha is a success at solving problems and resolving issues. I can honestly say I have learned more from Keisha than she could have possibly learned from me. She became part of my family. She shared my joys and struggles. I have a lifelong friend that I love like my own family. I am so proud of Keisha and I just wanted the world to know it. It is now over 7 years since Keisha was released. She has her own place and is moving soon to be with her Mom in their own place. She has a wonderful job with a big global shipping company and has passed all their requirements with a 100% accuracy. She is going from a temporary employee to full-time and is respected by all her co-workers. She has continued to speak out and help teens and pre-gang groups to see if her lessons can be shared and prevent violence among youth in trouble. Keisha also is in a wonderful relationship with someone who respects her and is a good partner. 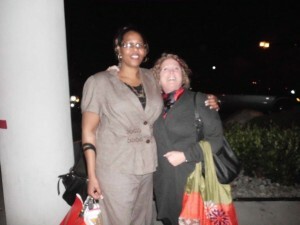 But most important Keisha introduced me to her life, her friends and I am now involved with the Action Committee for Women in Prison as their board president. Also, when another of her friend got released Keisha encouraged her friend to select me as her mentor. That relationship also has been very successful as well for over 6 years. I love my friendships with these two women and am so proud of them. I truly feel they are my sisters and we share so many great conversations and adventures. Mentoring works. I live it and breathe it everyday. It has totally changed me and showed me how young, bright women can get caught up in making bad choices but with friendship, time and energy can change and become a remarkable citizen of this country.